Fuel efficient Internal Combustion Engine technology presentation. · The conventional engine is preset with maximum compression ratio at maximum working cycle output such that the fuel used is never detonated or in the case of Diesel, always ignites. · At this stage, AB Engine has no limit to the type of fuel used or the Octane rating of Gasoline. CF provides information for the AB Engine controller regarding the fuel type, and the Controller provides the V2 piston position parameter that is necessary to satisfy fuel conditions. 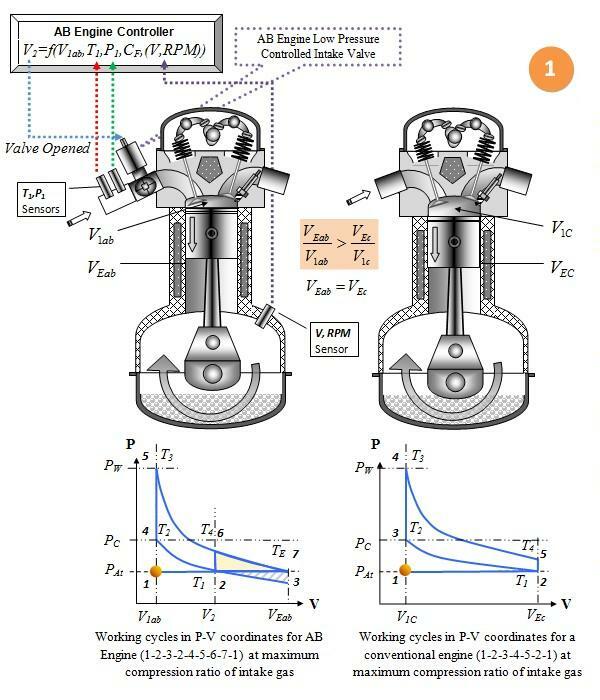 · The conventional engine has no ability to freely change the intake gas compression ratio so the maximum engine compression ratio V1/VC is preset as is the minimum for the harshest atmospheric conditions (assuming customer uses gasoline fuel with minimum Octane rating).